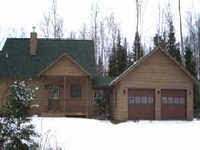 Beautiful Adirondack Property Available - Great Value! As some of my readers know, I am a real estate agent and business broker with the Prudential Terry Horrocks Real Estate Agency in Lake Placid, New York. I try not to talk real estate too much here in the blog, but since my website is not yet ready for prime time and I want to highlight a new listing we have in out office, I will make an exception. This property is a great house on 6.65 acres in Raybrook. It is "a nearly new, immaculate home with 2-car garage situated on 6.5 private acres bordering land of New York State affording excellent privacy and access to miles of trails for the outdoor enthusiast. Constructed in 2004, this single-owner, 3-4 bedroom home has an open floor plan with natural oak flooring, granite kitchen counter tops, raised panel wood doors and a huge family room. Natural light cascades into the home from its expansive windows adding to the home’s bright and airy feeling. Don’t miss taking a look at this new offering that is priced below its assessed value." Let me know if you would like to take a look.